If the existing paint coat is red, it will require more than one coat of white paint to hide it well. The number of necessary coats to cover completely the previous paint depends on the quality of the new paint used, (meaning the quantity of titanium dioxide contained in the white paint). When we use a product of superior quality, we usually need to apply 2 or 3 coats of white to cover up a bright red. If we do the opposite, paint red over white paint, we won’t need more than 2 coats. The number of necessary coats also depends on the degree of porosity of the surface to be painted. Is the surface smooth or matt (porous)? A matt surface will welcome a thicker coat of paint, thus reducing the number of required paint coats, as a polished surface (not porous surface) will require more (thinner) coats. 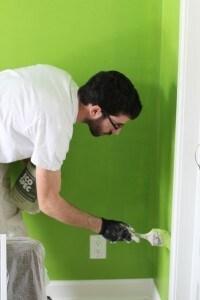 When using low-quality paints, it sometimes takes as much as 4 or even 5 paint coats to cover well a smooth wall (depending on the paint colors used). The concept of paint coats does not apply to spray painting. Indeed, when we use the traditional brush and roller technique, we have limitations in the quantity of paint that can be applied, which means that the paint coat will always be approximately the same thickness if we don’t want to have drips and if we do not add water in the product. A painter that spray paints adjusts the coat’s thickness and applies only one layer, with a few exceptions (e.g. : when the paint leaks or when it’s too cold, then 2 layers are required.) This method is to be used as often as possible, as it will have the painter spend less time, which will have you save on the painting bill! Know that with Findecor, you don’t have to worry about the number of paint layers to be applied. The painter who does the estimate includes the number of necessary paint coats on your written agreement, and if he is wrong, he will pay the difference himself. Contact a professional painter now for a free quote.